Lots of health, stamina and money. All weapons and upgrades are unlocked. Weapons reload time is decreased. 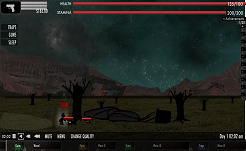 Balloon In A Wasteland Hacked and with Cheats is a shocking game with elements of Zombie. Arrow keys or WASD to move, click "Pause" to pause. Mouse to shoot. Cheats: Spikes do not kill you. Collect all 3 pieces of cheese.